The International Association of Oil and Gas Producers (OGP) has published a report advocating the use of ‘life-saving rules’ in its member companies. verify electrical isolation before beginning work. The core rules should be applicable to most high hazard industries, with the supplemental rules being suitable for selected industries. OGP recommends that the life-saving rules be implemented and supported by appropriate disciplinary action for non-compliance. The report contains a case study on the use of life-saving rules in Shell, where individuals can face disciplinary action up to and including dismissal for non-compliance. If a rule is broken (even if it didn’t result in incident) Shell first undertakes an investigation to determine why the rule was broken, and then takes appropriate disciplinary action – this may also include investigating supervisors and managers if they were complicit in the rule-break. Shell is of the view that it is better to take disciplinary action than to risk lives. The OGP life-saving rules were developed by examining OGP incident data between 1991 and 2010, with the aim that the core rules should cover the direct causes of at least 40% of fatal incidents, and be in line with life-saving rules already developed by OGP member companies. Together, the core and supplemental rules account for 70% of fatal incidents and 48% of high potential events. Organisations won’t be expected to implement all 18 rules. To select the appropriate rules to use, OGP recommends that each organisation undertakes a risk assessment to match the rules up with their own incident data and the type of work they undertake. Each rule is represented by a symbol based on the ANSI and EU safety icon format. Effort was made to make these as internationally recognisable as possible. Is the use of life-saving rules contentious? In some cases a single discretion can lead to dismissal, and so opponents have argued that they are too harsh and will lead to a culture of suspicion and blame in the workplace. Some may also see their use as an alternative to developing safety culture and personal responsibility. These misgivings may not be justified. At 2011’s Tripod User Day (September 2011, Amsterdam) Prof. Jop Groeneweg of the University of Leiden gave a talk on the use of life-saving rules in Shell and stressed that they are only worth implementing if they are proven to save lives, otherwise the workforce will not accept them. The successful use of the life-saving rules relies on non-compliances being reported, which means the rules need to be fully supported and believed in by the workforce. Consistent enforcement of the life-saving rules may also send the message that the organisation applies consistent standards for safety, and provides the potential to empower front-line workers when taking decisions to stop work on safety grounds. 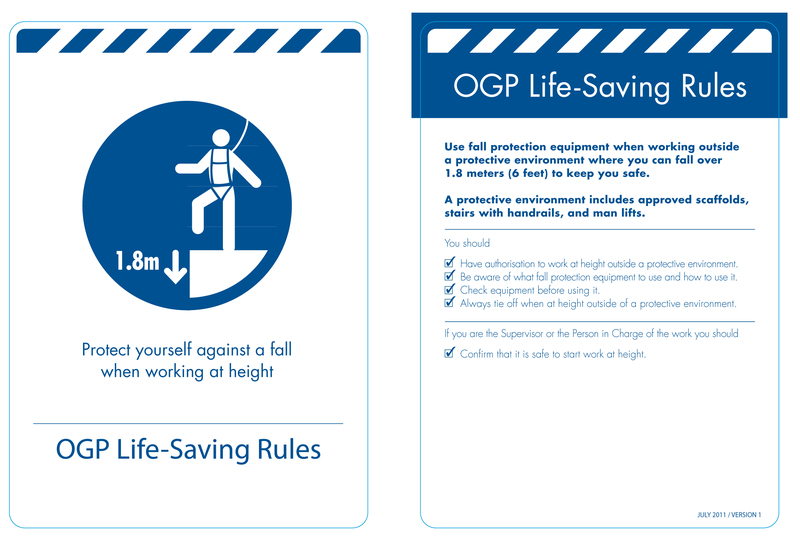 The OGP life-saving rules themselves focus on preventing only a selection of specific behaviours that are proven to be immediate causes to the majority of fatalities, and should therefore help to standardise the use of life-saving rules across industry. The real issues around the use of life-saving rules are likely to lie in their (mis)application. In organisations where non-compliances and unsafe working practices are commonplace, or where there is little trust between workers and management, it is questionable whether life-saving rules will be enforceable. Do organisations therefore require a fairly high safety culture to be already in place before life-saving rules can be implemented? Implementation of the rules may also depend on the rules themselves being workable – i.e. in there being systems in place to ensure the rules can physically be complied with. It is important to remember that the life-saving rules mainly relate to fatalities through personal injury (rather than process safety incidents), focus only on strengthening the last line of defence (the worker), and only on a selection of unsafe behaviours. They are just one part of a larger safety management system, to prevent the failure of a key barrier in what may be a chain of events leading up to an unsafe act, and one means of communicating with the workforce a commitment to safe standards of working. This entry was posted on Thursday, March 29th, 2012 at 11:13 am and is filed under Case Studies, Human factors, News, Non-EI activities. You can follow any responses to this entry through the RSS 2.0 feed. Both comments and pings are currently closed.